Background: There are numerous methods for calculation of glomerular filtration rate (GFR), which is a crucial measurement to identify patients with renal disease. Aims: The aim of this study is to compare four different methods of GFR calculation. Settings and Design: Clinical setup, prospective study. Materials and Methods: Data was collected from routine renal scans done for voluntary kidney donors (VKD) or renal transplant recipients 6 months after transplantation. Following technetium-99m diethylene triamine penta acetic acid injection, venous blood samples were collected from contralateral arm at 120, 180, and 240 min through an indwelling venous cannula and direct collection by syringe. A total volume of 1 ml of plasma from each sample and standards were counted in an automatic gamma counter for 1 min. Blood samples taken at 120 min and 240 min were used for double plasma sample method (DPSM) and a sample taken at 180 min for single plasma sample method (SPSM). Russell's formulae for SPSM and DPSM were used for GFR estimation. Gates' method GFR was calculated by vendor provided software. 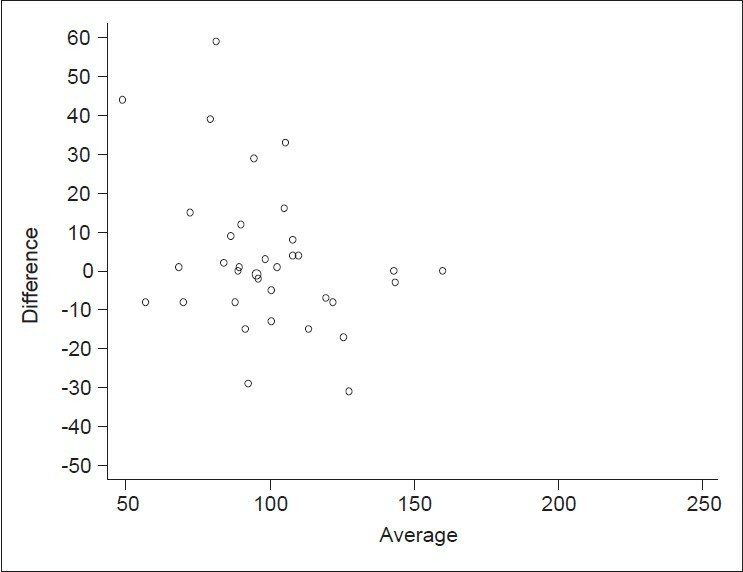 Correlation analysis was performed using Pearson's correlation test. Results: SPSM correlated well with DPSM. GFR value in healthy potential kidney donors has a significant role in the selection of donors. The mean GFR ± (standard deviation) in VKD using SPSM, DPSM, camera depth method and Cockroft Gault method was 134.6 (25.9), 137.5 (42.4), 98.6 (15.9), 83.5 (21.1) respectively. Gates' GFR calculation did not correlate well with plasma sampling method. Conclusions: Calculation of GFR plays a vital role in the management of renal patients, hence it was noted that Gates GFR may not be a reliable method of calculation. SPSM was more reliable. DPSM is reliable but cumbersome. It is difficult to accurately calculate GFR without a gold standard. Glomerular filtration rate (GFR) is defined as the volume of plasma that can be completely cleared of a particular substance by the kidneys in unit time. GFR is customarily assessed by measuring the concentrations of serum markers such as blood urea nitrogen and serum creatinine (Scr). Although widely used, these endogenous markers are not ideal and occasionally do not perform well. The other method for determining GFR is to measure the clearance of exogenous substances such as inulin, iohexol, chromium-51-ethylenediaminetetraacetic acid (EDTA), technetium-99m labeled diethylene triamine penta acetic acid (Tc-99m DTPA) or I-125 labeled iothalamate. As the definition of classifying chronic renal disease becomes more dependent on accurate calculation of GFR, it is imperative that a reliable method to calculate GFR is obtained. GFR can be calculated from the rate of clearance of tracer activity from the plasma following a single intravenous injection of a suitable radiopharmaceutical. As long as the radiopharmaceutical is excreted exclusively by glomerular filtration and is not bound to plasma protein or to any other component of blood or other tissue, the GFR can be calculated simply by dividing the administered dose by the integral of plasma time-activity curve. Initially GFR was calculated from the multisampling technique with the samples taken at 5, 10, 15, 30, 45, 60, 120, 180, 240 min. A time-activity curve was plotted. GFR was calculated from the dose divided by the area under the curve. Since it was exhaustive and difficult to perform in routine clinical practice, single and double plasma sampling GFR formulae were derived from multi sample technique. Fairly accurate methods have been proposed in which the GFR is estimated from only one or two plasma samples rather than from a multi sample time-activity curve. In routine nuclear practice, the gamma camera (GC) method is popular as it can provide immediate calculation of individual kidney function as well as of global renal function. Gary Gates  computed the GFR from the scintigraphic determination of Tc-99m-DTPA uptake within the kidneys and ever since then this has become universal and versatile. With the above factors in mind, it was decided to compare the single and double plasma sampling method with Gates GFR and observe the reliability of these measures in routine clinical practice. A total of 88 patients, who were sent to our department for routine renal study, were either voluntary kidney donors (VKD) or 6 months post-renal transplant recipients (PTR) were included in this prospective study. Fifty patients in VKD and 38 patients in PTR group were analyzed. The patient selection process involved identifying those patients who fulfilled the criteria given below. Patients aged 18 years and above, undergoing nuclear medicine imaging either as a VKD or post 6 months PTR. Patients aged below 18 years, pedal edema or patients who underwent diuretic studies. All patients were seen during the consultation, informed of the nature of the study and informed consent was obtained. We compared the single plasma sampling method (SPSM), double plasma sample method (DPSM), Gates camera method, and Cockroft Gault (CG) method. Tc-99m-DTPA plasma clearance measured by DPSM and SPSM: Patients were requested to drink 300-500 ml water after breakfast and 20 min prior to taking the plasma sample. Radioactivity in the syringe containing Tc-99m-DTPA was measured before injection. A bolus of about 185 MBq Tc-99m-DTPA was injected into the patients' forearm. Residual radioactivity in the syringe was measured again and injected dosage of radioactivity was calculated. After scintigraphy, the site of injection on the arm was scanned under the GC. The residual radioactivity at the injection site was less than 0.1% in all subjects. Following Tc-99m-DTPA injection, venous blood samples (4 ml) were collected in a syringe from the contralateral arm at 120, 180, and 240 min through an in-dwelling venous cannula. The blood samples were centrifuged and 1 ml of plasma from the sample as well as the standards was counted in an automatic gamma counter (Cobra II, Packard) for 1 min at the same time. The blood samples were centrifuged at 1000 g for 10 min to separate the red blood cells from the plasma. A test dose of 1 ml of plasma was pipetted meticulously by taking care to avoid disturbing the interface between the plasma and the red cells. Decay of radioactivity was corrected. Time at which the blood sample was taken was recorded on the worksheet. As the procedure takes a minute or two, the time of sampling was taken as the midpoint of the blood collection time and was recorded to the nearest minute. The blood samples taken at 120 min and 240 min were used for the DPSM and a sample taken at 180 min was used for SPSM. Russell's method was used for GFR estimation. Tc-99m-DTPA plasma clearance by SPSM (true GFR) was calculated according to the following equation: Russell's method: The GFR, in ml/min, is given by: A ln D/P + B Where: A = −0.278T + 119.1 + 2450/T, B = 2.886T − 1222.9 − 16820/T, D = total injected dose counts (cpm), P = plasma activity (cpm/ml), T = sampling time (180 min). Where D = total injected dose counts (cpm), P1 = activity (cpm/ml) at the time of T1 , P2 = activity (cpm/ml) at the time of T2 , T1 = 120 min, T2 = 240 min. After selection of the energy peak and window of Tc-99 m, the plasma samples were counted with appropriate standards and blanks for background in a well counter. The background counts were subtracted. This was done on the same day of the test and correction factor was applied for the decay of Tc-99m during the counting process. Quality control was performed on all equipments (balance, dose calibrator, well counter etc.) used in the procedure. As Tc-99m-DTPA was prepared in-house at our center, regular chromatography for the labeling efficiency was performed. The radiochemical purity was > 95%. Where Wt = the patient's body weight in kilograms and Ht = height in centimeters. The BSA corrected GFR was distinguished by referring to it in units of ml/min/1.73 m 2 . In this method, the GFR was automatically calculated by the software in Infinia Hawkeye (GE) GC. A region of interest (ROI) was drawn manually for each kidney from 2 to 3 min summed images. The infrarenal background ROI was assigned. Firstly, fractionated uptake (FU) of each kidney was assessed according to the equation. where Ccr is expressed in milliliters per minute, age in years, Ideal body weight (IBW) in kilograms and Scr in milligrams per deciliter. Estimate Ideal body weight in (kg). All statistical analyses were performed using SPSS 16.0 (SPSS Inc., Chicago, USA), Stata 10 (StataCorp LP, College Station, USA) was used for Bland Altman plotting in order to define the 95% limits of agreement. All the data were expressed as mean ± standard deviation (SD) of the mean. 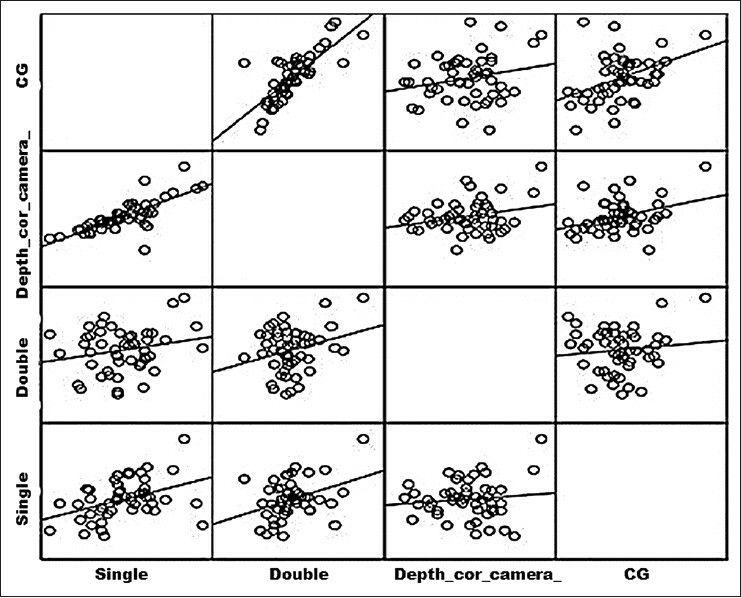 Correlation analysis was performed between SPSM, DPSM, CG, and Gates' camera method using Pearson's correlation test. Bland Altman plot was done for those methods which had significant correlation. The study had 88 participants consisting of VKD (n = 50) and PTR (n = 38). The mean age in VKD group and in PTR group was 40 years. In VKD 56% were females and 44% were males, whereas in PTR 18% were females and 82% were males. The mean ± (SD) GFR using SPSM, DPSM, camera depth method and CG method was 134.6 (25.9), 137.5 (42.4), 98.6 (15.9), 83.5 (21.1) respectively [Table 1]. There was good and significant correlation between SPSM and DPSM. There was poor and non-significant correlation between SPSM and camera depth method and DPSM and camera depth method. The CG method had moderately significant correlation with SPSM, DPSM but not with camera method [Table 2]a. Bland Altman plot for SPSM and DPSM for VKD showed mean difference of −2.80 (95% confidence interval [CI] = −10.7-5.1). The limit of agreement ranged from −58.79 to −53.11 [Figure 1]a. And similarly for SPSM and depth corrected camera method for VKD the mean difference was 36.1, 95% CI (28.3, 43.8). The limit of agreement ranges from − 18.4 to 90.6 [Figure 1]b. In PTR the mean ± (SD) GFR using SPSM, DPSM, camera depth method and CG method was 98.7 (22.7), 97.4 (28.1), 57.1 (23.5), 65.2 (15.4) respectively [Table 1]. There was good and significant correlation between SPSM and DPSM. There was moderate, but significant correlation between SPSM and camera depth method. 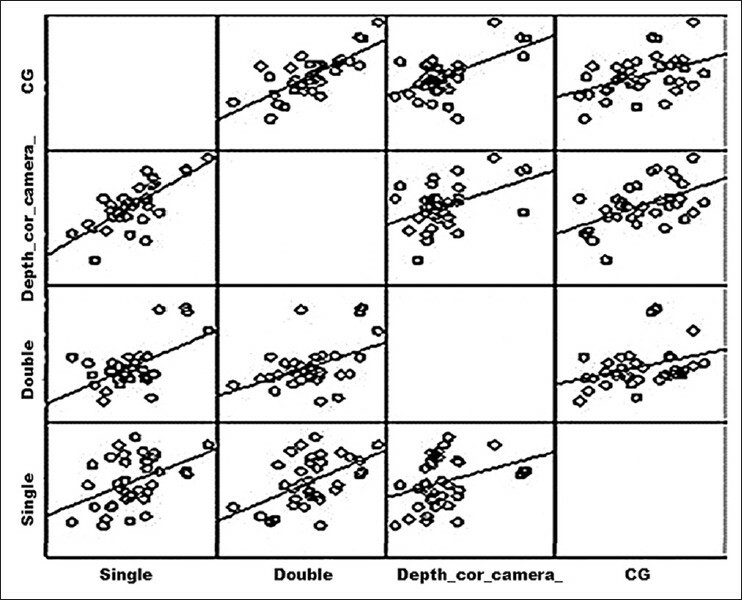 The correlation between CG method and SPSM, DPSM was moderate, but not significant with camera depth method [Table 2]b. Bland Altman plot for single plasma sample and double plasma sample for PTR showed mean difference of 3.02%, 95% CI (−3.34-3.39), with a limit of agreement range from −34.6 to 40.7 [Figure 2]. Bland Altman plot for SPSM and camera depth method for PTR showed mean difference of 41, 95% CI (33.9-48.1), with a limit of agreement range from − 2.16 to 84.2 [Figure 3]. The Bland Altman plot was not utilized for the prediction equation (CG) as there was very poor correlation. 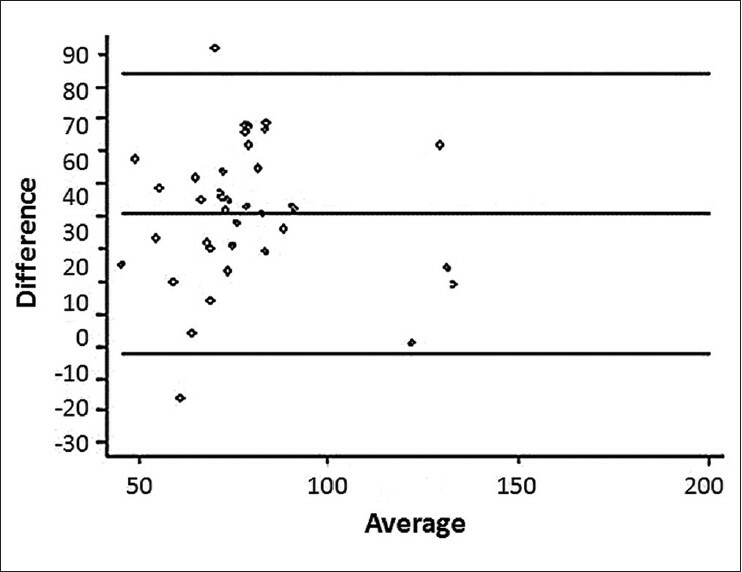 Scatter plot in [Figure 4] and [Figure 5] shows the clustering of values toward the center in the SPSM and DPSM for GFR evaluation and skewed in other combination. The estimation of GFR is indeed a challenging task in view of the fact that innumerable equations and methods have been derived and yet not one method correlates exactly with the other. However as GFR is a valuable measure in the assessment of renal patients there ought to be a reliable, reproducible method for estimation. The primary objective of this study was to estimate GFR using four different methods and to assess the correlation between one another and to assess the feasibility of these methods in day-to-day clinical practice. All clearance techniques are coupled with several potential errors, including errors in pipetting, sample timing and preparation of the standard against which the blood sample indicator concentrations are calibrated. Additional errors are associated with the measurement of administered indicator, failure to completely inject the syringe contents and unintentional partial extravascular injection of indicator and errors in measurement of the patient's height and weight all the more for patients who are severely ill or have special circumstances, such as being bed bound or being amputees. Therefore, when measuring GFR in a routine clinical setting, mechanisms for checking the dependability of the result are needed for illustration of good quality control and quality assurance. Blaufox et al. recommended SPSM as the first choice for determining GFR. Our analyses too were based on comparison of each method with the SPSM as it was not possible in our setup to acquire inulin, which is undoubtedly the gold standard method for calculating the GFR. GFR, unlike tubular secretion is not influenced by normal variations in the degree of hydration because of autoregulation mechanisms. Although specific hydration is not usually required, a steady intake of fluids for the duration of study is recommended (approximately 200 ml/h). To estimate the GFR using radioisotopes very low levels of activity is sufficient, which is indeed a boon to avoid the hazardous effects of radiation and maintain the as low as reasonably achievable principle. The Gates  method was considered feasible as it did not involve the cumbersome method of calculation. Nuclear medicine, for many years has had methods for quantitation of renal function, which are simple, accurate and reproducible, do not require urine collection and can be performed on an outpatient basis. This method's reliability was questioned by many studies. The estimation of GFR using Gates method is very simple when compared to the plasma sampling method, which was very cumbersome. In the latter, the timing of sample collection should be accurate. In a busy department, collecting samples and processing them consumes a significant amount of valuable time and dedicated personnel ought to be available throughout the entire procedure. In the present study, we did not use the DPSM following a single injection of Tc-99m-DTPA as the reference method; instead the SPSM was used as mentioned in the literature. ,, In the present study, we found that the SPSM correlated well with the DPSM. Our results are consistent with other published data in the literature. In the large sense, it has been estimated that the GFR for the Indian population is much lower than the western population. Barai et al., have suggested that the mean GFR value of a young healthy Indian adult potential kidney donor is 81.4 ± 19.4 ml/min/1.73 m 2 BSA, which is significantly different from the normal value of 109-125 ml/min derived from a western population. The demonstration of a lower GFR value in healthy Indian potential kidney donors can have significant consequences in the selection of kidney donors. Similarly in our study, it was found that the mean GFR in VKD the mean ± (SD) GFR using SPSM, DPSM, camera depth method and CG method were 134.6 (25.9), 137.5 (42.4), 98.6 (15.9), 83.5 (21.1) respectively. The CG and Gates method was more or less equivocal in terms of GFR in the Indian context going by the normal range as estimated in the literature; however, the SPSM and DPSM depicted a higher value in VKD. In PTR, it was noted that the mean ± (SD) GFR using SPSM, DPSM, camera depth method and CG method were 98.7 (22.7), 97.4 (28.1), 57.1 (23.5), 65.2 (15.4) respectively. This indicates a fairly higher value in SPSM and DPSM. CG method gave a value nearing the normal GFR for Indian population, but Gates method estimated very low values. In a study by Mulligan et al.,  the DPSM using Russell's formula has been vouched as a reliable method for the valid estimate of true GFR. When we look at this statement in the light of our study we have appreciated a fairly good correlation between SPSM, DPSM but not between CG and Gates method. In a study by Itoh et al. on 50 patients with various degrees of renal dysfunction, it was found that the SPSM tended to show some scattering in GFR below 30 and above 140 ml/min/1.73 m 2 . On the contrary, the DPSM tended to be scattered in GFR above 120 ml/min/1.73 m 2 . They stated that: The DPSM is essentially a method of choice for a patient in whom the GFR is expected to be below 30 ml/min/1.73 m 2 and these two methods may be chosen selectively in dependence on the preserved renal function, which is expected at the time of the test. In the same study, Russell's SPSM was compared with 10 sample method and the correlation coefficient was 0.971 and that of Gates and 10 sample method was 0.774. Zuo et al. reported that the DPSM should be used in order to obtain reliable reference GFR values, when GFR is less than 45 ml/min/1.73 m 2 . As the 10 sample study was cumbersome, we did not venture into this method; however, in our study, there was a fairly good and significant correlation between SPSM, DPSM for both VKD and PTR. The Gates method overestimated GFR in the study by Aydin et al. However in the present study, the Gates method tended to underestimate GFR compared to the SPSM, DPSM. Itoh  also reported overestimated GFR values with the Gates method and indicated that the overestimation might be attributable to insufficient correction for background activity in the kidney. Russell et al. suggested that the Gates method with a simple background activity correction is less accurate than the methods with more sophisticated background activity correction for the calculation of GFR. , We used infra-renal background ROIs for background correction in the present study. The linear attenuation coefficient for Tc-99 m in water is 0.153/cm and our software program uses this value to correct for soft-tissue attenuation as is the case in other studies. ,, However, the effective attenuation coefficient is lower in soft-tissue than in water because of the presence of scattering photons. This is another major drawback of the Gates method in the calculation of GFR. Our findings show that GFR with the Gates method is poorly correlated with SPSM and DPSM for VKD. There was moderate, but significant correlation between SPSM and camera depth method for PTR. There are numerous equations described to estimate Ccr and a valid prediction of GFR by incorporating biometrical variables such as age, height, weight, gender and race with Scr concentration and other biochemical parameters. modification of diet in renal disease (MDRD) and CG formulae have been the most frequently used among them. However, it has been debated whether the equations accurately predict the GFR. ,,, In our study, the CG method showed poor correlation with SPSM, DPSM and camera method (r = 0.419, r = 0.360, 0.114 respectively) for VKD. In PTR, the correlation between CG method and SPSM, DPSM and Camera depth method was 0.409, 0.525 and 0.319 respectively. Other methods such as chronic kidney disease-epidemiology collaboration (CKD-EPI) have been studied. White et al. showed that MDRD could be replaced by CKD-EPI equation however, in a review article by Earley et al. it was concluded that "Neither the CKD-EPI nor the MDRD Study equation is optimal for all populations nor GFR ranges. Using a single equation for reporting requires a tradeoff to optimize performance at either higher or lower GFR ranges." Lin et al. reported that neither the MDRD nor CG formulas may be sufficient for estimating GFR and radioisotope studies may be needed for better assessment. In their study, 117 potential kidney donors were included. Three blood samples post-administration of Tc-99m-DTPA was regarded as the reference method. The bias and correlation coefficient values were found to be 6 ml/min/1.73 m 2 , −36.5 ml/min/1.73 m 2 ; and 0.41 and 0.43 for CG and MDRD formulae, respectively. In another study, Itoh  studied 133 patients with a wide range of renal function and found that CG correlates well with Tc-99m-DTPA blood sampling method (r = 0.82). However, in this study, it was reported that the CG formula is not accurate for the measurement of GFR. A clinician's final decision regarding a potential kidney donor requires an accurate GFR measurement. Our study has investigated four methods and compared the results with the Tc-99m-DTPA SPSM, which was considered as the reference. Our results demonstrate that the SPSM correlate moderately well with the DPSM. Neither the Gates method nor the prediction equation (CG) could calculate GFR accurately. All these techniques tend to underestimate GFR and may result in mistakes in the management of potential kidney donors or PTR. The number of patients in our study was small. Gold standard "inulin" was not available and hence not compared. Normal GFR in the Indian population has not been standardized. GFR in renal transplant recipients using several methods has not been compared extensively. The conclusions from this observational prospective study were as follows: Calculation of GFR plays a vital role in the management of renal patients, hence it was noted that Gates GFR may not be a reliable method of calculation. The SPSM was more reliable. DPSM is reliable but cumbersome. It is difficult to accurately calculate GFR without a gold standard. No single method can be taken as a valid one to assess GFR, these methods have to be compared and validated with a gold standard. If there are no such options the SPSM GFR can be used to assess GFR. Gates GFR cannot be used for estimation of GFR, however in view of its simplicity in performance it can still be approved if a depth corrected GFR is standardized for our Indian population based on studies with large numbers from multiple centers. Dr. Deepthi Kattula, Department of Gastrointestinal Sciences, Christian Medical College, Vellore, for the statistical analysis and Mr. Danie Kingslin Heck and Mr. Prabhu Titus, Technologists, Department of Nuclear Medicine, Christian Medical College Vellore for their support. 1. Russell CD, Bischoff PG, Kontzen FN, Rowell KL, Yester MV, Lloyd LK, et al. Measurement of glomerular filtration rate: Single injection plasma clearance method without urine collection. J Nucl Med 1985;26:1243-7. 2. Gates GF. Computation of glomerular filtration rate with Tc-99m DTPA: An in-house computer program. J Nucl Med 1984;25:613-8. 3. Haycock GB, Schwartz GJ, Wisotsky DH. Geometric method for measuring body surface area: A height-weight formula validated in infants, children, and adults. J Pediatr 1978;93:62-6. 4. Watson WS. A simple method of estimating glomerular filtration rate. Eur J Nucl Med 1992;19:827. 5. Cockcroft DW, Gault MH. Prediction of creatinine clearance from serum creatinine. Nephron 1976;16:31-41. 6. Russell CD, Bischoff PG, Kontzen F, Rowell KL, Yester MV, Lloyd LK, et al. Measurement of glomerular filtration rate using 99mTc-DTPA and the gamma camera: A comparison of methods. Eur J Nucl Med 1985;10:519-21. 7. Waller DG, Keast CM, Fleming JS, Ackery DM. Measurement of glomerular filtration rate with technetium-99m DTPA: Comparison of plasma clearance techniques. J Nucl Med 1987;28:372-7. 8. Rehling M, Møller ML, Thamdrup B, Lund JO, Trap-Jensen J. Simultaneous measurement of renal clearance and plasma clearance of 99mTc-labelled diethylenetriaminepenta-acetate, 51Cr-labelled ethylenediaminetetra-acetate and inulin in man. Clin Sci (Lond) 1984;66:613-9. 9. Fleming JS, Ramsay B, Waller DG, Ackery D. Measurement of glomerular filtration rate with a portable cadmium telluride detector. Nucl Med Commun 1987;8:751-7. 10. Jackson JH, Blue PW, Ghaed N. Glomerular filtration rate determined in conjunction with routine renal scanning. Radiology 1985;154:203-5. 11. Gates GF. Glomerular filtration rate: Estimation from fractional renal accumulation of 99mTc-DTPA (stannous). AJR Am J Roentgenol 1982;138:565-70. 12. Aydin F, Güngör F, Cengiz AK, Tuncer M, Mahsereci E, Ozdem S, et al. Comparison of glomerular filtration rate measurements with the two plasma sample and single plasma sample, gamma camera Gates, creatinine clearance, and prediction equation methods in potential kidney donors with normal renal function. Nucl Med Commun 2008;29:157-65. 13. Itoh K. Comparison of methods for determination of glomerular filtration rate: Tc-99m-DTPA renography, predicted creatinine clearance method and plasma sample method. Ann Nucl Med 2003;17:561-5. 14. Bird NJ, Peters C, Michell AR, Peters AM. Using the slope-only technique and estimated glomerular filtration rate for checking the reliability of slope-intercept measurement of glomerular filtration rate. Nucl Med Commun 2008;29:1086-92. 15. Blaufox MD, Aurell M, Bubeck B, Fommei E, Piepsz A, Russell C, et al. Report of the Radionuclides in Nephrourology Committee on renal clearance. J Nucl Med 1996;37:1883-90. 16. Fleming JS, Wilkinson J, Oliver RM, Ackery DM, Blake GM, Waller DG. Comparison of radionuclide estimation of glomerular filtration rate using technetium 99m diethylenetriaminepentaacetic acid and chromium 51 ethylenediaminetetraacetic acid. Eur J Nucl Med 1991;18:391-5. 17. Cousins C, Gunasekera RD, Mubashar M, Mohammadtaghi S, Strong R, Myers MJ, et al. Comparative kinetics of microvascular inulin and 99mTc-labelled diethylenetriaminepenta-acetic acid exchange. Clin Sci (Lond) 1997;93:471-7. 18. Christensen AB, Groth S. Determination of 99mTc-DTPA clearance by a single plasma sample method. Clin Physiol 1986;6:579-88. 19. Hansen HP, Rossing P, Mathiesen ER, Hommel E, Smidt UM, Parving HH. Assessment of glomerular filtration rate in diabetic nephropathy using the plasma clearance of 51Cr-EDTA. Scand J Clin Lab Invest 1998;58:405-13. 20. Itoh K, Tsushima S, Tsukamoto E, Tamaki N. Accuracy of plasma sample methods for determination of glomerular filtration rate with 99mTc-DTPA. Ann Nucl Med 2002;16:39-44. 21. Itoh K, Tsushima S, Tsukamoto E, Tamaki N. Reappraisal of single-sample and gamma camera methods for determination of the glomerular filtration rate with 99mTc-DTPA. Ann Nucl Med 2000;14:143-50. 22. Li Y, Lee HB, Blaufox MD. Single-sample methods to measure GFR with technetium-99m-DTPA. J Nucl Med 1997;38:1290-5. 23. Barai S, Bandopadhayaya GP, Patel CD, Rathi M, Kumar R, Bhowmik D, et al. Do healthy potential kidney donors in India have an average glomerular filtration rate of 81.4 ml/min? Nephron Physiol 2005;101:p21-6. 24. Mulligan JS, Blue PW, Hasbargen JA. Methods for measuring GFR with technetium-99m-DTPA: An analysis of several common methods. J Nucl Med 1990;31:1211-9. 25. Zuo L, Ying-Chun, Wang M, Zhang CL, Wang RF, Wang HY. Prediction of two-sample (99m) Tc-diethylene triamine pentaacetic acid plasma clearance from single-sample method. Ann Nucl Med 2005;19:399-405. 26. Prigent A, Cosgriff P, Gates GF, Granerus G, Fine EJ, Itoh K, et al. Consensus report on quality control of quantitative measurements of renal function obtained from the renogram: International Consensus Committee from the Scientific Committee of Radionuclides in Nephrourology. Semin Nucl Med 1999;29:146-59. 27. Russell CD. Sources of error in the estimation of GFR by scintgraphy. In: Tauxe WN, Dubovsky EV, editors. Nuclear Medicine in Clinical Urology and Nephrology. Norwalk, CT: Appleton-Century-Crofts; 1985. p. 173-84. 28. Russell CD. Estimation of glomerular filtration rate using 99mTc-DTPA and the gamma camera. Eur J Nucl Med 1987;12:548-52. 29. Yap HK, Sundram FX, Yip WC, Tay JS, Ang ES, Toh HJ, et al. Estimation of glomerular filtration rate in children using 99m-technetium DTPA. A comparison with 51-chromium EDTA clearance. Acta Paediatr Scand 1985;74:579-83. 30. Zubal IG, Caride VJ. The technetium-99m-DTPA renal uptake-plasma volume product: A quantitative estimation of glomerular filtration rate. J Nucl Med 1992;33:1712-6. 31. Inoue Y, Ohtake T, Homma Y, Yoshikawa K, Nishikawa J, Sasaki Y. Evaluation of glomerular filtration rate by camera-based method in both children and adults. J Nucl Med 1998;39:1784-8. 32. Gaspari F, Ferrari S, Stucchi N, Centemeri E, Carrara F, Pellegrino M, et al. Performance of different prediction equations for estimating renal function in kidney transplantation. Am J Transplant 2004;4:1826-35. 33. Poole SG, Dooley MJ, Rischin D. A comparison of bedside renal function estimates and measured glomerular filtration rate (Tc99mDTPA clearance) in cancer patients. Ann Oncol 2002;13:949-55. 34. Lin J, Knight EL, Hogan ML, Singh AK. A comparison of prediction equations for estimating glomerular filtration rate in adults without kidney disease. J Am Soc Nephrol 2003;14:2573-80. 35. White CA, Akbari A, Doucette S, Fergusson D, Knoll GA. Estimating glomerular filtration rate in kidney transplantation: Is the new chronic kidney disease epidemiology collaboration equation any better? Clin Chem 2010;56:474-7. 36. Earley A, Miskulin D, Lamb EJ, Levey AS, Uhlig K. Estimating equations for glomerular filtration rate in the era of creatinine standardization: A systematic review. Ann Intern Med 2012;156:785-95.